Little did Hilary Knight know over Christmas when she was vacationing in Sun Valley and strengthening her surgically-repaired hip that she would finish her first post-collegiate winter on skates as a professional women’s hockey champion. Sun Valley resident Knight and her Boston Blades teammates achieved that distinction Saturday in Canada. The Blades trounced three-time Canadian Women’s Hockey League (CWHL) champion Montreal Stars 5-2 in the championship game of the Clarkson Cup tournament before 800 spectators at Markham Centennial Centre near Toronto, Ontario. Knight, 23, in her first year with the Blades after a record-setting college hockey career at the University of Wisconsin, had been named CWHL Most Valuable Player last Wednesday—the first American born MVP in the league’s six seasons. She didn’t score against Montreal in the finale, but her teammates did—four times on the power play while killing off seven penalties. Montreal out-shot Boston 42-34, but Blades goalie and native Canadian Genevieve Lacasse, 23, from Providence College stopped 40 of 42 shots for the win. Punching home a three-goal natural hat trick to break a 2-2 tie was 5-11 Blades forward Kelley Steadman, 22, of Plattsburgh, N.Y., who starred for the Mercyhurst (Erie, Pa.) Lakers in NCAA Division 2 women’s hockey. Scoring the first two Blades goals for a 2-0 lead early in the second period was 5-9 forward Jen Schoullis, 24, of Erie, Pa. from the University of Minnesota. Both Steadman and Schoullis were teammates of Knight on the American gold medalist team in the 2011 International Ice Hockey Federation (IIHF) tournament—Knight scoring the game-winning goal in the U.S. 3-2 overtime goal over Canada. It was the first Clarkson Cup title for the Blades, a third-year CWHL expansion team and the only American-based team in the five-team professional women’s hockey league. Steadman was named the championship game’s No. 1 star, ahead of No. 2 star Caroline Ouellette of Montreal and No. 3 star Lacasse, the Boston Blades goalie. Ouellette, 33, a three-time Canadian Olympic gold medalist who played for University of Minnesota-Duluth, assisted on Montreal’s second goal in Saturday’s finale and also scored the overtime top-shelf power-play winner to beat Boston 1-0 in Friday’s Clarkson Cup preliminary round game. Knight led coach Digit Murphy’s Blades (22-4-1, 82-44 goals-against) with 17 goals and 15 assists for 32 points during the 24-game regular season, then added a tournament-best 1 goal and 4 assists for 5 points in the four-team Clarkson Cup tournament. She was part of a distinguished field of nominees for the MVP honor. With a field that featured Switzerland’s Florence Schelling and Canada’s Ouellette, it was the first time the finalists for the CWHL MVP came from three different countries. Ouellette is also a member of the Triple Gold Club (the accomplishment is not yet officially recognized by the IIHF for women), as one of only three women to win the Clarkson Cup, a gold medal at the Olympic Winter Games, and gold at the IIHF women's world hockey championships. Knight is only an Olympic gold medal away from becoming a member of that elite club, due to Saturday’s Clarkson Cup win. Not only did Knight lead all U.S.-born players in CWHL scoring, she finished second in rookie scoring and third in the scoring race for the Angela James Bowl. That prize, going to the regular season scoring winner, went for a second straight year to Meghan Agosta-Marciano of Montreal Stars, with 46 points. Agosta-Marciano, 26, a two-time Canadian Olympian who played for Mercyhurst, was the MVP of Team Canada’s 2010 Winter Olympic triumph. She scored the first goal for the Montreal Stars in Saturday’s Clarkson Cup finale. The Clarkson Cup, named for former Governor General of Canada Adrienne Clarkson and given annual to the CWHL championship team, is becoming known as the Stanley Cup of women’s hockey. It has a permanent home in the Hockey Hall of Fame located in downtown Toronto. 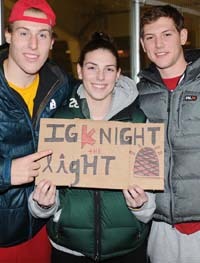 Next up for Knight and the U.S. national team is the 2013 IIHF Women’s World Championship April 2-9 in Ottawa, Can. In the Group A preliminary round, Team USA plays Canada April 2, Finland on April 3 and Switzerland on April 5. Quarterfinals and semi-finals are April 6 and 8, with the bronze medal and gold medal game April 9. Last April, Team Canada won its 10th IIHA world gold medal 5-4 in overtime over three-time gold medalist Team USA, at Burlington, Vt. The teams in Group A are Canada, USA, Switzerland and Finland. The Group B teams are Sweden, Russia, Germany and Czech Republic. Last year at worlds in Vermont, the Swiss beat Finland 6-2 in the bronze medal game. Last Wednesday night, the Blades opened the Clarkson Cup with a 3-2 victory over the Toronto Furies (10-13-1) at Markham, Ont. Knight assisted on all three Blades goals. On Thursday, the Blades blanked the No. 3-seeded Brampton Thunder 2-0 with Knight assisting on forward Kate Buesser’s game-winning goal, and Knight finishing it off with an empty-netter. The Friday and Saturday games between pre-tournament favorites Boston and Montreal marked the seventh and eighth times the teams had played this season—the teams splitting those eight games with four wins apiece. Toronto defeated Brampton 4-3 in overtime Friday night for third place in the Clarkson Cup.